The cage François BOUCHER (Paris 1703 - Paris 1770) Deposit from the national collections of the Louvre Museum, this oil on canvas is attributed to the painter François Boucher in 1763. It is present in the collection of the MAHB since 1976. This work depicts shepherds and shepherdesses, in rich, bright and brilliant costumes, evolving with grace and sensuality in a landscape of theatrical scenery. The Cage from François Boucher is a work in the series of Pastorales, one of the favorite themes of the protected painter of King Louis XV and his favorite Marquise de Pompadour. This subject reflects the sentimental literature with country themes then fashionable as well as the lightness and frivolity of the gallant festivals of a light and libertine aristocracy, in search of pleasures, yet on the threshold of its decline. 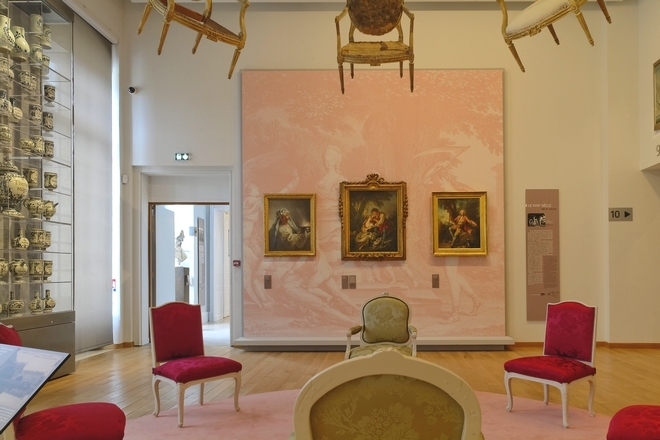 A gallant atmosphere is suggested by the dominant pink color and reproduction of the toile de Jouy in the museum room dedicated to the seventeenth century.